MANTRA Studio Team welcome You to our website. Our studio is an effect of work and dreams of our zealots. For many years we have been interested in different tabletop war-games, painting and converting miniatures or making tabletop sceneries like woods, buildings, to name a few. We are a young team – open minded and full of many new ideas. As gamers and collectors, we know that there is nothing as beautiful as finely painted miniature standing on tabletop field of battle. It is already 10 years that we have been creating a wide variety of such miniatures. Nonetheless we are still working on upgrading our skills. MANTRA Studio was founded to share with You our passion, ideas and experiences. We are here to realize Your dreams and most daring ideas. Customers from across the whole world have placed their trust in us, their satisfaction and loyalty to our studio evidences high quality service and products that we offer. 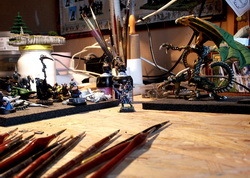 For most part, we paint, convert and sculpt miniatures used in many different war-game systems for customers worldwide. On top of that, we produce scenery pieces for gaming purposes (both, for fantasy and S-F) – hills, forests, lakes, buildings etc. and dioramas – so much appreciated by collectors. In addition to the above, we can make modeled bases (also resin ones) and movement trays for your miniatures. We process individual orders and offer our products on ebay, internet auction service. In the nearest future we plan to enlarge our offer by opening an internet store, in which You will be able to find Bits for both Warhammer Fantasy Battle and Warhammer 40000, you will also be able to find many accessories necessary for each true hobbyist. All the time we are looking for new ideas and challenges, so if You haven’t found in our offer, what you were searching for, do not hesitate to contact us, we shall be entirely at Your disposal. We take great care to ensure that our products are of the highest quality. Satisfaction of our customers is our top priority, this is why models are always consistent with their description and pictures (in which they are presented). We are doing our best to make the package as safe as possible, so that our models could not be damaged during the transport. If unfortunately, You will receive a damaged model, contact us! You may send the model to us at our cost, we shall repair it and send it back. If you have any additional questions, contact us!